Description: The M&P M2.0 pistol, the newest innovation to the respected M&P polymer pistol line. Designed for personal, sporting, and professional use, the M&P M2.0 delivers an entirely new platform, introducing innovative features in nearly every aspect of the pistol, including trigger, grip, frame, and finish. Highlights of the M&P M2.0 pistol include an extended stainless-steel chassis and a low barrel bore axis for reduced muzzle rise and faster aim recovery. The M&P M2.0 pistol further improves performance with a fine-tuned, crisper trigger, lighter pull and a tactile and audible reset. The pistol includes an aggressively-textured grip and four interchangeable palmswell inserts for optimal hand-fit and trigger reach. Features • Truglo® TFX™ Sights - Encapsulated tritium plus fiber optic xtreme handgun sights. • Low barrel bore axis makes the M&P pistol comfortable to shoot reducing muzzle rise and allowing for faster aim recovery. • Optimal 18-degree grip angle for natural point of aim. • Four interchangeable palmswell grip inserts for optimal hand fit and trigger reach - S, M, ML, L. • Aggressive grip texture for enhanced control. 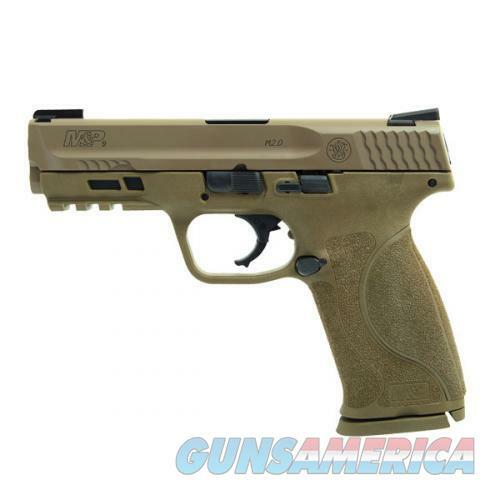 • New M&P M2.0 crisp trigger with lighter trigger pull. • Tactile and audible trigger reset. • Accurate 1 in 10” twist M&P M2.0 barrel. • Extended rigid embedded stainless steel chassis to reduce flex and torque when firing. • Armornite® durable corrosion resistant finish.